I use Eurostar in many of my social media training sessions and presentations as an example of an organisation that (still) hasn’t really got social media. The reason for this is that while their traditional customer care may be quite good, it hasn’t yet worked out how to do real-time customer care, using social media. I use a couple of examples: one is an instance of lack of response to some rather poor food I was once served (see this post) and the other is in relation to a horrible delay I experienced nearly a year ago. 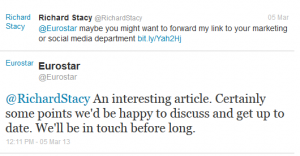 The issue, in both cases, is that fact that Eurostar are not doing the number one thing any organisation needs to do first in social media: listening to their customers and responding in real time. Facebook is the number one social media place, we therefore need to work-out how to make our Facebook presence as engaging as possible. An unfortunate consequence of doing this is the fact that as well as (rather than) looking at the lovely posts about our latest offers, people also use our page to ask questions and often complain. We therefore need to deal with this rather awkward side-effect of Facebook usage, in order to prevent it spoiling our otherwise lovely Facebook page, full of its “engaging content”. Agency, please sort all this out for us. Agency finds management of Facebook presence is highly lucrative, therefore does have incentive to push alternative approaches. 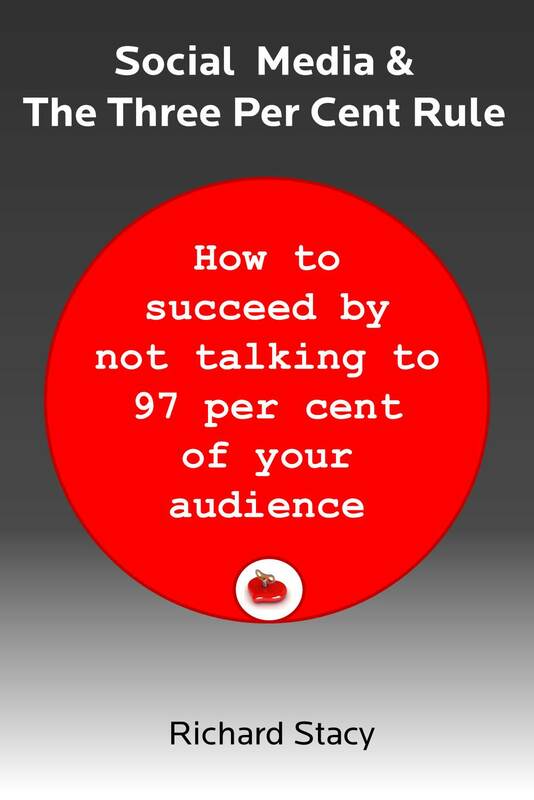 (Note: so many organisations I deal with put two social media issues on the table, often framed as objectives: how do we make our facebook page more engaging / popular, and how do we deal with people writing negative things on our Facebook page. To which I always say, position your Facebook page as a listening place, not a content place and actively encourage people to ask questions or complain). What Eurostar have not done is start from a base-line objective of working out how best to use social media to listen and respond to their customers and thus work out what sort of infrastructure and, critically, process they need to put in place. This is witnessed by my experience with the delay last year. As I was sat there on a train that was going no-where, I tweeted @Eurostar for some information. No response. The train was so delayed it only reached London in the early hours, long after my last train out to Suffolk had left. I therefore tweeted Eurostar to alert them to this and ask for advice. No response. 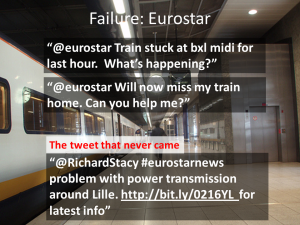 What I draw attention to in my training is how much more positive my experience with Eurostar could have been if they had answered my tweets and included in the response a link to a real time social information hub, where the latest information could be posted, alongside using a tag such as #eurostarnews. Putting this in place is so simple and efficient. Eurostar would not even have to answer most of the questions / tweets directed because if it could direct people to the places or spaces where the answers existed people could find the answers for themselves. I cannot believe that an organisation that has been “in” the social space as long as Eurostar and deals with the sort of real-time issues involved in travel, does not yet have this real-time information capability in place. It just has a service update section on its website that relates to generic issues, such as planned engineering work or industrial action. It is a classic example of organisational focus on Content rather than Information and it means that Eurostar is passing-up on a huge reputational benefit: what I call creating the expectation of listening. Anyway – to end on a positive. As I said, Eurostar’s traditional customer service is actually very good. As a result of the delay, because there were not available hotel rooms in London to put me up, they provided a black cab to take me the 100 plus miles home. They were also giving people cabs as far-afield as Liverpool and York. They also gave me a compensation booking – equivalent to a free return trip, valid for a year. What’s more, I have just called them to redeem this booking – and it was relatively easy to find the number to ring and I wasn’t kept waiting on the line for ages and a very helpful person fixed me a new ticket right away – a process actually easier and quicker than the normal on-line system. So Eurostar know how to do it in the conventional way – but they don’t yet know how to do it in the social way – probably because social media is still seen primarily as a function of marketing and as a new channel to reach customers, rather than as a channel customers can use to reach Eurostar. Anyway – I will keep my eye on Eurostar and as soon as they put an effective real-time listening and response capability in place I will be sure to promote this and shift Eurostar from the negative to the positive-case study section of my workshops and presentations. Update: I tweeted this post and Eurostar picked it up and responded almost immediately. 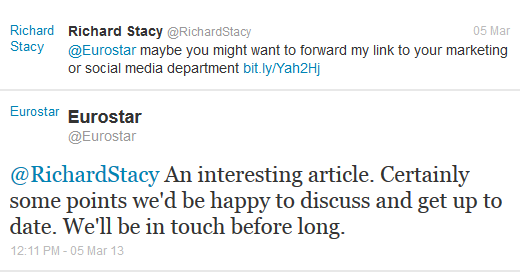 Good listening, but I am not sure they have worked out a response yet! I would guess that they are monitoring their @twitter space but haven’t actually read the post and this tweet is therefore a standard placeholder. Let’s see if the substance of the post get dealt with. Update 2: They have responded more specifically, albeit with a little encouragement. Update 3: I now have a call scheduled next Tuesday with Eurostar’s online community service leader! (And, by the way, We Are Social no longer work with Eurostar, social media has been brought in-house, which may account for the higher quality of response on the Facebook page). Big Data: gold mine or fool’s gold?